Fall is here. The kids are in school, the weather is getting cooler, and the days are getting shorter. With that comes cold and flu season. 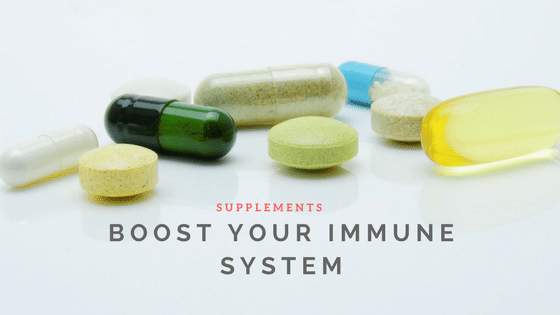 Instead of waiting for that first sneeze or tickle in your throat, try one of these proactive supplements to boost your immune system which can fight from seasonal allergies. Most people have heard of Echinacea. However, in order to reap the benefits, you need to take Echinacea before you’re sick. Studies are mixed on whether Echinacea can shorten a cold, but if you take it as soon as others around you are getting sick, you may be able to avoid or at least lessen symptoms. Echinacea works best if you take it 3 or 4 times daily for seven to 10 days. Using a tincture is most effective, but pills can work too if you can’t find a tincture. It’s important to take a break from using it so your body doesn’t get used to it. Loading up on vitamins during cold and flu season will make your immune system stronger. Again, while this isn’t a cure for the common cold, upping your dosage of vitamin C can help you ward off illness. This works because cells in the immune system use vitamin C to fight off viruses. Vitamin D plays an important role, too. A deficiency in vitamin D can increase your likelihood of getting an infection. The best way to get these vitamins is to eat a balanced meal and take a multi-vitamin. Many find that taking zinc at the first sign of a cold helps reduce symptoms and get better faster. Astragalus root is used in Traditional Chinese Medicine to boost the immune system. A Beijing study showed that astragalus helps to control the body’s immune responses, which in turn reduces the chances of getting sick. Astragalus is best used as a prevention method, so take this before you actually get sick. Tinctures and capsules are the most popular method of consumption. Elderberries come from the plant Sambucus Nigra. According to the University of Maryland Medical Center, this extract, called Sambucol, can shorten the duration of a cold or flu by as many as three days. Raw elderberries are poisonous, so they need to be cooked thoroughly. You can buy Sambucol at many health and food stores, and you can get it in syrup, gummy, or tablet form. Unlike many other herbs, Sambucol is effective even if you are already sick, so it is great to keep around the house. Haleigh Missildine is a millennial freelance writer for hire who writes about all things lifestyle and health. When she’s not writing, she’s practicing yoga, playing guitar, or petting her cat. You can find her at www.twitter.com/haleighcamille1 or www.haleighmissildine.com.